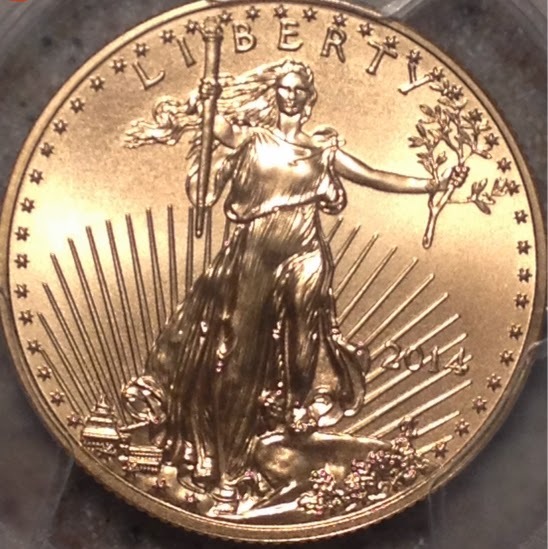 Tony Lawrence's Coins & Stuff: Another High Relief Gold Eagle? For the 30th anniversary, as I have suggested several times before, the Mint should issue a special high relief version of the silver and gold eagles, and then it should move forward with the recommendation of the CCAC to change the design of at least the silver eagle and possibly the gold coin too. The picture above is the only Eagle gold that I currently own. It's not a high relief and it only the half ounce $25 version. I wish I had more, but these gold Eagles get darn expensive. I'd love to own a high relief gold. The 1907 UHR (Ultra High Relief) St. Gaudens is way out of my price range - around $10,000 in any condition and hundreds of thousands in high grade. Even the 2009 UHR is steep - $2,000 to $3,000, which has given me pause in spite of my desire. I'm not so keen on a UHR silver Eagle as Lou suggested. I suppose I'd buy one or two at issue, but it wouldn't make my heart race like the gold would. But unless something changes, a 2016 UHR would be a stomach churner for me also. If gold stays around its current level, that would probably be a $1,500 plus purchase and while I really do love it that much, I have to keep some realistic limits on my budget. Investment value, you say? Yes, possibly, but it's also possible that a 2016 UHR would be hurt by the 2009 and vice versa. Part of the allure of Eagle UHR's is that it's a reasonable replacement for those of us who can never afford the St. Gaudens version. If there were suddenly two to choose from, the value might not be as high. I might suggest that if this is considered, doing it to the $25 version might be better. I think it's still large enough to benefit (though I could be wrong) and it would lessen any negative impact on the 2009 and also be more affordable to those of us with limited funds. That won't happen, though, so I have to say that I'm against the idea. I think I'm against it. Maybe not.